A new 3D science fiction adventure game Cradle will be released this spring. 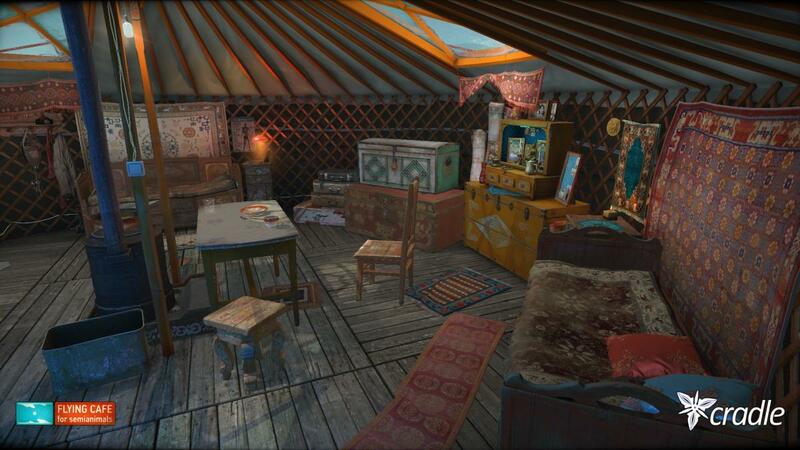 Based on Unigine game engine, Cradle will feature beautiful surroundings and rich 3D graphics. Cradle is a science-fiction first-person quest with freedom of movement. The story is built around the relations of the protagonist and a mechanical girl, who by enigmatic circumstances find themselves together in a yurt among the desert Mongolian hills. The player is to restore the lost functions of his companion's mechanical body parts and together reveal the mystery of the neglected entertainment park found not far from the yurt. Game powered by cutting-edge Unigine technology. “Our goal is to deliver the player a specific emotional experience similar to what we may see in a night dream, where our life is completely different from the real one, with its own past and present. Cradle is a strange beautiful dream filled with anticipation of discovering a deep old mystery” - Ilya Tolmachev, the Creative Director and Founder of Flying Cafe. Cradle will be available for Linux, Windows, Mac OS, Android and iOS.